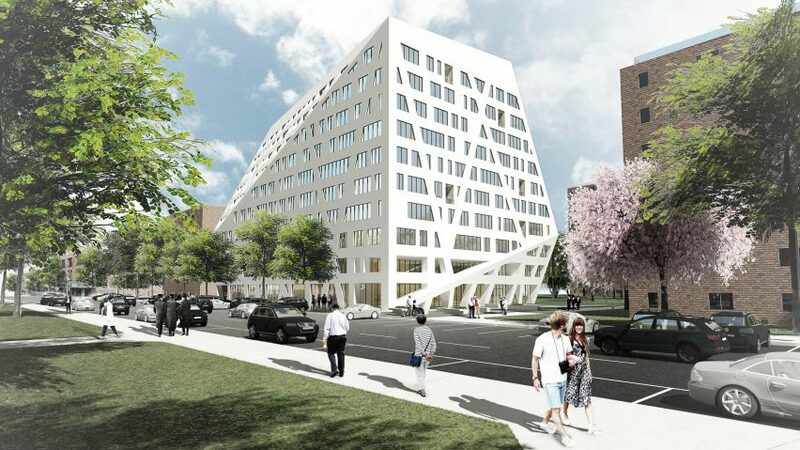 Daniel Libeskind's architecture firm has revealed it design for a faceted affordable housing block for seniors in Brooklyn's Bed-Stuy neighbourhood. Studio Libeskind has released three renderings of the 10-storey apartment block, which will be built on a plot in the Sumner Houses estate in Bedford-Stuyvesant – often shortened to Bed-Stuy. Although the firm designed the masterplan for the World Trade Center redevelopment, this housing block will be Studio Libeskind's first building in New York City. Construction is set to begin in 2020. The locally based firm has designed the building as part of a city-wide scheme to construct affordable housing for seniors on property owned by the New York City Housing Authority, known as Housing New York 2.0's Seniors First. Featuring a white angular form, the block will contain 197 residential units that will all be affordable to "extremely low, very low, and low-income individuals" for the duration of the 99-year-long lease. A 10,285-square-feet (955-square-metre) community facility will be placed at ground level facing Marcus Garvey Boulevard. "I am extremely grateful and inspired by this opportunity to contribute to the Bed-Stuy community," said architect Daniel Libeskind. "I believe I can speak for our entire team that our goal is to serve the senior community by creating homes that give a sense of civic pride and create more much needed affordable housing in New York City," added Libeskind. Studio Libeskind was selected to oversee the design of the project alongside a team that includes; Selfhelp Community Services, a non-profit that provides services to vulnerable seniors living in New York; RiseBoro Community Partnership, an organisation that develops communities in Brooklyn and Queens; and affordable housing developers Urban Builders Collaborative/Lettire. The housing will feature a geometric shape similar to a number of projects that the firm is currently working on – including the Modern Art Center (MAC) in Lithuania and the Pyramid Toweryramid-shaped skyscraper in Jerusalem. Large chunks will be cut from the corners at the base of the simple white cuboid volume to create a pair of glazed covered entrances at ground level. Another large portion will be shaved off at the upper lever to creates balconies for some of the residences. Other details include diagonal bands that will criss-cross the walls over the windows, which are arranged in a regular layout. A courtyard at the centre of the building will be used as a private green space. Libeskind, who placed at number 154 in 2017 Dezeen Hot List of the world's most newsworthy forces in design, founded his eponymous studio in 1989. As cities densify a number of architects and designers have developed dramatic ways to provide affordable residences. Studio James Law Cybertecture developed a prototype for stacking low-cost micro homes in Hong Kong's concrete pipes, while design student Llywelyn James proposed cantilevering affordable housing on London's brownfield sites.